In today’s global marketplace, remarketing and selling surplus equipment is time consuming, labor intensive and costly. The process requires diverse resources and in-depth knowledge on federal and international laws, complex logistics, tax accounting, equipment configuration, marketing, advertising and a database of customers. 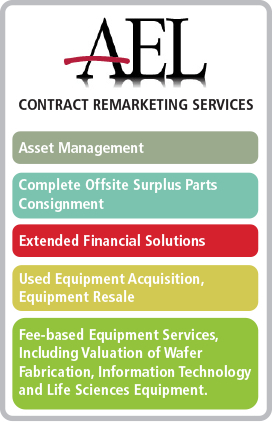 AEL’s asset management team facilitates this process by offering remarketing services to quickly and efficiently convert surplus equipment into cash. Our remarketing service and methodology ensures your surplus equipment is presented to the entire global market increasing the opportunity for your equipment to sell faster and at market value. Our process combines real-time equipment analytics generated from various equipment trades and historical trade data. These processes allow customers to quickly and efficiently select, evaluate, price, forecast, resell, and, ultimately, monetize equipment purchases in the secondary equipment market. fee-based equipment services, including valuation of wafer fabrication, information technology and life sciences equipment.